Send data from your HappyFox Chat account to Mixpanel. Track your visitor's behaviour on the chat widget installed on your website. 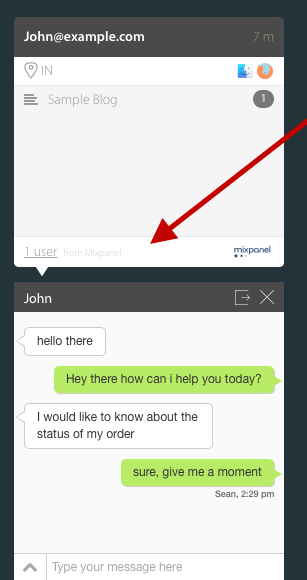 View visitor engagement information from Mixpanel during an ongoing chat. Only Admin has the access to Integrate Mixpanel with HappyFox Chat. The integration is available from Mighty and above plans. 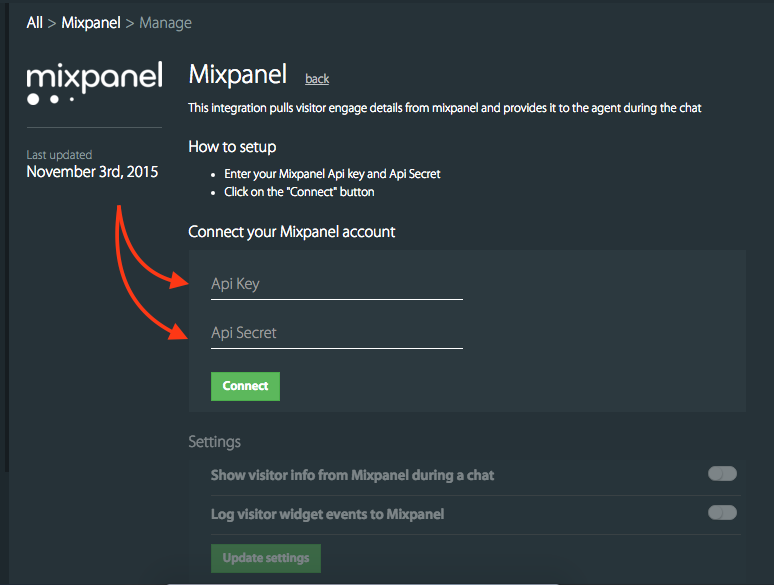 Login to your Mixpanel account. Click Account. You will get a pop-up window. Now click on Projects tab. Copy the API Key and API Secret. 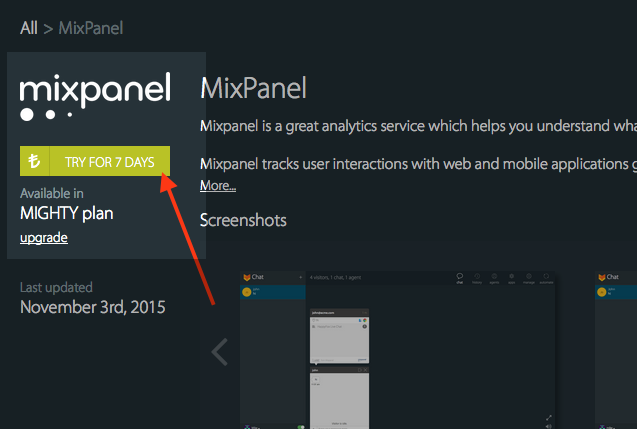 Step 2: Go to Apps --> Mixpanel. Step 3: Click on "TRY FOR 7 DAYS" button. Step 4: Paste the API Key and the API Secret Key and Click "Connect" button. Step 5: Now update your preferences under Settings and click Update Settings. Copy Mixpanel's tracking library code and paste it into your website's source code where the HappyFox Chat widget has been installed. Login to your Mixpanel account and Go to Segmentation and view the visitor widget events recorded from HappyFox Chat. Now you have successfully connected you Mixpanel and HappyFox Chat account. 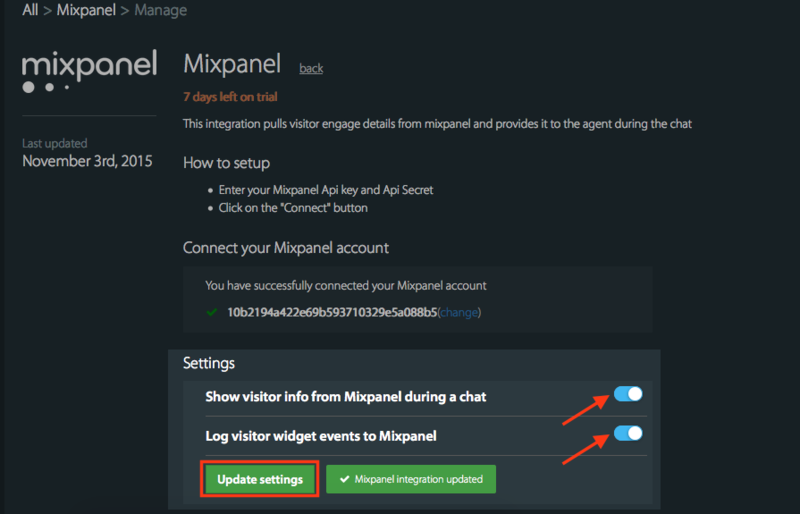 View the live visitor engagement information of your HappyFox Chat account by enabling Mixpanel integration.